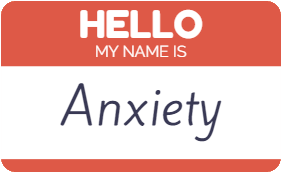 Anxiety is a term used to describe feelings of unease, worry and fear. This would include the emotions and physical sensations we might experience when worried or nervous about something. Anxiety is related to fight or flight response, which is our normal biological reaction to feeling threatened. A common response to anxiety is to ignore it. It can be difficult but if you can, facing up to how anxiety makes you feel can be the first step to breaking the cycle. 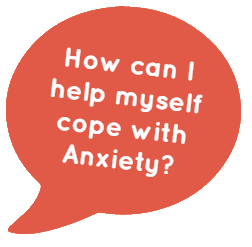 There are many things you can try to help you cope with anxiety. Here are a few suggestions of things you can do to work out how to manage your fears and reduce your anxiety. Sometimes just talking to someone about what makes you anxious can make a difference. They might have even experienced similar feelings themselves and be able to chat through it with you or give you some suggestions as to how they coped. Having someone who will listen and show that they care can help. Learning relaxation techniques can help you with the mental and physical feelings of anxiety. Try breathing exercises which may help you feel calmer. You may find it helpful to distract yourself from the way you are feeling. Mindfully observe a flower or picture, anything you find interesting or comforting. You might also find it helpful to use a stress ball or focus on completing a puzzle. Some people find music comforting, listening to music that you find peaceful or that you enjoy can help you feel better. Try making yourself an upbeat playlist for when you’re feeling down or worried. Going for a walk or a run can help you get some time to yourself to clear your mind. If you’re not able to do physical activities outdoors, or have limited mobility, there are smaller activities you can do indoors that may help too. You may find it easier to relax if you avoid stimulants such as coffee, cigarettes and alcohol. Some people also find a healthy diet helps them to manage anxiety better. In situations like this it is understandable to feel a little worried about how you perform or what the outcome will be. You may even find you find it hard to eat, sleep or concentrate because you are worried. How do I know it’s a problem? Does worrying and anxiety affect your daily life? Are your worries and anxieties extremely stressful and upsetting? Do you worry a lot – i.e. does it affect you nearly every day and has lasted for at least 6 months? If you answered ‘yes’ to any of these you should talk to someone you trust or go to see your GP. See below for advice. Everyone is different. Sometimes people go to a talking therapy, sometimes they take some medication and sometimes they do both of these. It may also be enough to just talk to someone you trust in order to help you deal with situations. It all depends on how severe your anxiety is and how long it has been affecting you. Speak to your GP or professionals working with your child, they can make referrals to the Family Wellness Project on your behalf.